For those of you who are not overly familiar with YouTube, there has been intensifying racial controversy concerning an individual who is arguably considered to be the most successful video game entertainer and is the highest subscribed content creator on the website. Felix Kjellberg, known widely by his gaming moniker PewDiePie, has rocked the boat in the internet community since February of this year. Various instances of racial insensitivity and blatantly anti-semitic “jokes” – such as paying someone to hold up a sign saying “Death to all Jews” – in combination with a change in public personality, have soured the opinions of many in the vlogging and gaming community. Felix made his claim to fame through the unprecedented popularity of his various video game playthroughs. His channel, which has become synonymous with content like horror games, popular “fad” games and videos that include wacky, zany and “lol xD random” antics, have attracted a specific kind of fan base that has become the centre of much debate. Due to the exaggerated, “comedic” nature of his online persona, Felix’s fans are largely composed of adolescents between the ages of 13 to 16. They have also been largely supportive of whatever trouble Felix has gotten himself involved in, an explanation for why his channel didn’t receive nearly as much criticism from YouTube itself in February. He has a zealous and loyal following, which currently stands at over 57 million subscribers. There is significant speculation and confusion, as to the motivation behind his latest actions. Felix is often featured in the background of many vlogs and real-life videos, specifically made by his YouTuber girlfriend Marzia Bisognina, where he seems rather shy and self-contained – the polar opposite of how he portrays himself on his own channel. He is setting a terrible example for many of his extremely impressionable fans and an even worse precedent for many of the flourishing and future popular gaming personalities in the community. Now it isn’t possible to be certain which of these personalities are the true Felix, which is where most of the confusion has stemmed from. It is important to mention his fan base because it is relatively well known that Felix is not overly dedicated to them himself. It is well known that fans can be overbearing, boundary-pushing and just plain creepy; including attempting to locate where they live, visit and harass them in public. While this is no surprise to many popular “YouTube celebrities,” it seems that Felix may be trying to utilize these radical forms of “comedy” as a means of distancing himself from his youthful fan base. 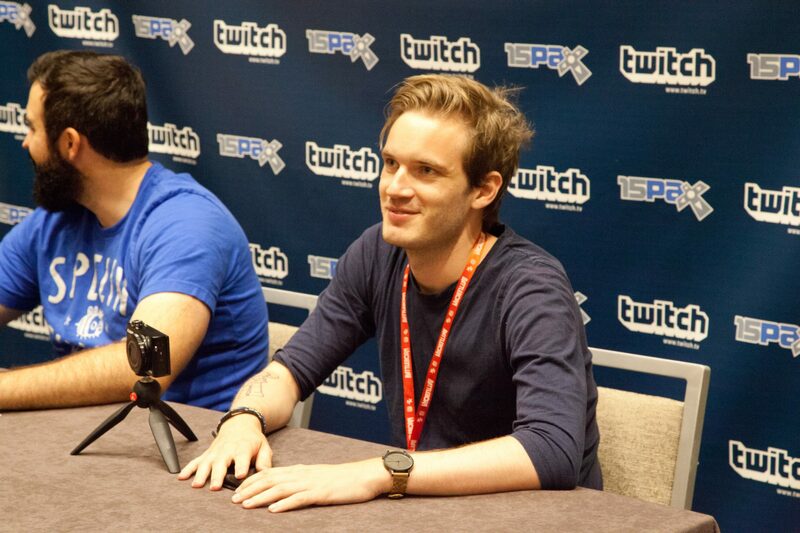 Felix has stated publicly that he never expected, nor wanted, to become famous and that his surprising prominence in the YouTube community was largely unplanned. However, the fact remains that he has maintained his channel and made no public attempt to alter his online persona, or communicate to his followers if he’s outgrown his PewDiePie portrayal that has seemingly made him uncomfortable. He continues to create content, a banner of hypocrisy exemplified in his latest videos such as “I’ve never given up like this” and “help.” These examples of click bait are generated to gain the most views and increase the amount of ad revenue he receives from clicks, more than anything else. Regardless of his careless attitude toward what he says and does on camera, he still earns his income from the fans that watch his videos and the merchandise that he markets to them, things that include overpriced sweatshirts and fidget spinners. It’s completely understandable that personas such as PewDiePie are designed to draw in a large, younger audience, ones that may become tiresome to the actual person himself after years of being exposed to them. However, the manner in which he is going about this is going to be crippling for his future career. He is either a flagrant anti-semite and racist, or simply inconsiderate and unprofessional. There is a certain degree of credibility that popular online presences should adhere to and Felix is one who adamantly refuses to properly uphold that responsibility for the sake of his ever growing audience. You must have never heard of the new Family Friendly Felix.